Multraship confirms its purchase of the two tugs now being constructed in Romania for delivery in June/July 2013. 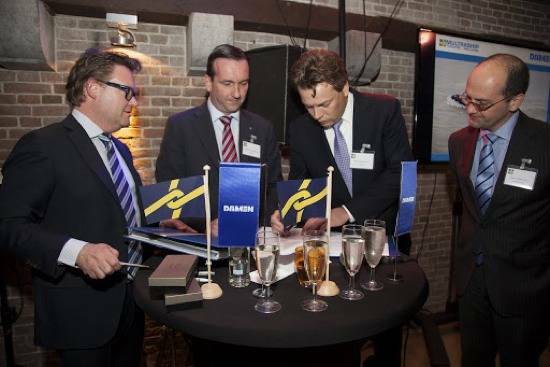 Contracts for the two tugs, to be named Multratug 26 and Multratug 27, were signed during the course of Multraship’s recent annual client gathering in Terneuzen. 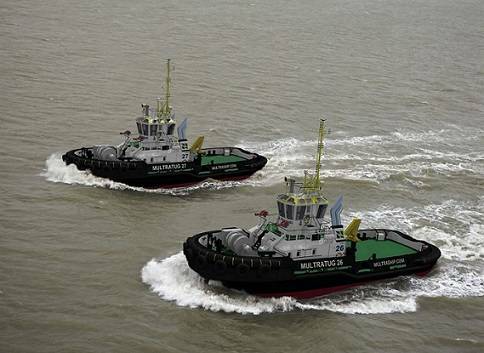 Multraship managing director Leendert Muller said, “The new tugs will be mostly engaged in harbour towage activities in the Zeeland Seaports and Antwerp areas. In addition to their primary duties, they will also be on standby, ready to respond in the event of fire- or explosion-related emergencies in the western and central part of the River Scheldt, as part of a February 2013 commitment entered into with the Zeeland Safety Region to keep two FiFi 1 tugs on standby. The tugs will have a minimum bollard pull of 62.5 tons and a maximum speed of 13.5 knots. They are being built at Damen Shipyards, Galati, Romania, where Multraship has a representative office and provides towage and salvage services as part of its strategic coverage of the Black Sea area.